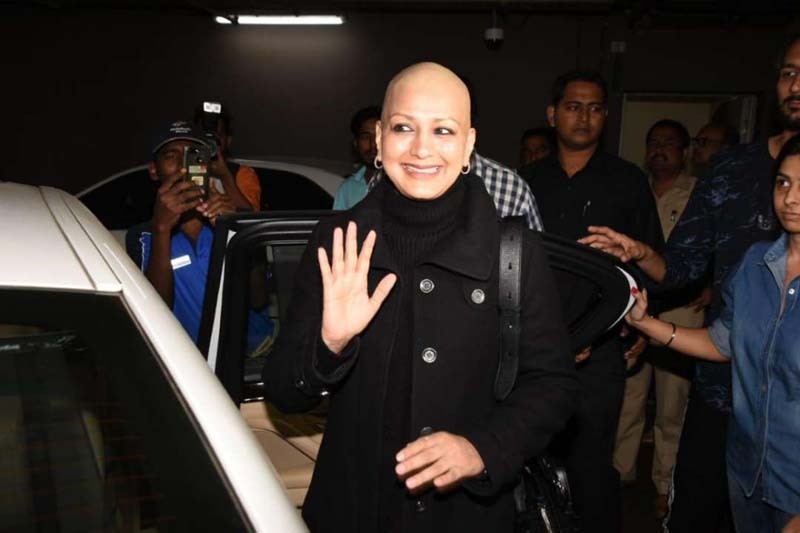 After six months of braving her fight against high grade cancer, actress Sonali Bendre finally returned to Mumbai in the wee hours of Monday (December 3) and was beaming with joy obliging paparazzi with a heartwarming smile and gratitude. The 43-year-old who had undergone treatment for her metastatic cancer in New York will now have to go for regular checkups and scans to ensure that the deadly disease won't strike back. Her husband Goldie Behl, who was accompanying the actress at the Mumbai airport, told ANI, "It's been six months and I would like to inform everybody that Sonali is doing good and she is back for good. She is recovering very well. Thank you all for the love and support. Her treatment is over, for now, Sonali is absolutely fine. Just like what happens in such diseases - regular checkups, regular scans - that we have to do since this disease can come back." "For now there is nothing as such that she will have to go back for. I am very happy that she is back home. Like any other patient, she will have to go for regular checkups. She is a very strong and determined woman and I am very proud of her," he added. Earlier, Sonali had shared on Instagram informing fans how she was excited to come back to Mumbai after completing her chemotherapies for her cancer treatment. "The fight is not yet over... but I'm happy and looking forward to this happy interval," reads an excerpt from Sonali Bendre's Instagram post. With support from her family and friends, Sonali has always remained positive in her outlook as she battles the serious ailment. She has been putting up a brave fight against high-grade cancer which she discovered only after reaching a critical stage in July. Post her diagnosis, the Duplicate actress is quite active on social media platforms and constantly gives updates about her health to the fans.